Will Nandan Nilekani make a meaningful impact in Indian politics? Speculation is rife that Nandan Nilekani is going to contest the upcoming Lok Sabha elections from the South Bangalore constituency on a Congress ticket. 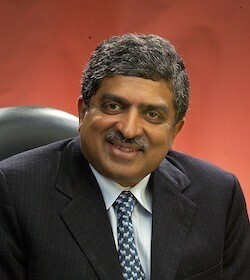 Currently, Nandan Nilekani is the Chairman of the Unique Identification Authority of India (UIDAI), a cabinet-ranking position that he took up in 2009 under the invitation of Prime Minister Dr. Manmohan Singh. Nandan Nikekani has a formidable record till now, being the co-founder of Infosys and served as its CEO from March 2002 to April 2007. He was awarded the Padma Bushan, one of India's highest civilian honours, in 2006. The speculations of Nandan Nilekani joining politics and contesting the upcoming Lok Sabha elections have generated considerable interest in India, since there are high expectations from him to bring the benefits of high end technology to the common man. How will Nandan Nilekani's future shape up in politics? Will he be successful in creating a meaning impact in Indian politics? Ganesha analyses the Surya Kundli of Nandan Nilekani and presents his perspective. Ganesha observes the Surya Kundli of Nandan Nilekani and notes that Natal Saturn rules the 10th House of political career, which is retrograde and conjunct with Natal Moon in the 6th House. This factor indicates dealings with government and its agencies. Chances of involvement in politics as a career also arise due to this combination. However, Nandan Nilekani may not get tremendous success due to the retrogression of Natal Saturn. He may have to tread a difficult path even before the Lok Sabha elections are due, and difficulties may continue even after the elections have concluded. At present, Nandan Nilekani is under the influence of Saturn return through the 6th House. In addition, Rahu is also passing through the 6th House. Hence, this factor indicates he may just be partially successful in politics. Due to the affliction of Natal Moon, he may face several discomforts in the Indian political arena. Moreover, malefic Ketu is transiting over his Ascendant Lord, Venus, through the 12th House. Hence, the overall path of his political career will witness a bumpy ride.